What are the Roth IRA early withdrawal rules? What are the penalties for an unqualified distribution? And what are the special exceptions? You need to know in case you ever need to withdraw funds, otherwise you risk an unwanted visit from the IRS. With the exception of rare cases, early withdrawal of investment earnings from your Roth IRA will trigger either income taxes, a 10% early withdrawal penalty, or in most cases, both. According the IRS, you can NOT withdraw investment gains from your Roth IRA tax-free and penalty-free until after age 59 ½. You also need to meet the requirements of the Roth IRA 5 year holding period before you can make tax-free, penalty-free withdrawals. That means you must open and fund your Roth IRA, and then wait 5 tax years before making a withdrawal. For instance, let's say you open and fund your Roth IRA in May 2012. Five tax years must pass before you meet the requirements of the 5 year rule - 2012, 2013, 2014, 2015, and 2016. In 2017, withdrawals will meet the 5 year rule. As another example, let's assume you open and fund your Roth IRA in March 2012, but since you have until April 15th of the following tax year to make a contribution, you designate your March contribution as a 2011 contribution. Five tax years must still pass, but even though you opened your account in the calendar year 2012, you funded it in the tax year 2011. So that's when the clock starts. 2011, 2012, 2013, 2014, and 2015. So, in this case, even though you opened and funded your account in the same calendar year, you meet the requirements of the Roth IRA 5 year rule a year earlier. 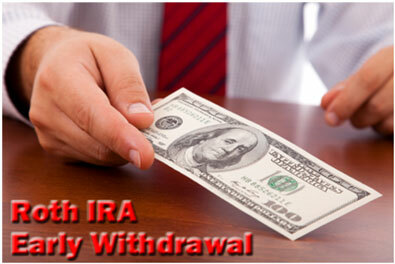 Let's take a look at how different types of withdrawals are effected by the Roth IRA early withdrawal rules. You can withdraw your original Roth IRA contributions at any time and for any reason and they won't constitute an early withdrawal. Because you fund your Roth IRA with after-tax dollars, you don't have to worry about paying income taxes if you later decide to withdraw those funds earlier than expected. And regardless of your age or your account's status in regard to the 5 year rule, the IRS does NOT impose a 10% early withdrawal penalty on the withdrawal of original contributions. For example, let's say you open and fund a Roth IRA with $5,000 at age 25. You fully intend to leave these funds in your account until age 59 ½ or later. Nevertheless, at age 30, you need to come up with an extra $5,000 for a down payment on your dream home. In such a scenario, you can withdraw the original $5,000 contribution tax-free and penalty-free. It's not considered a Roth IRA early withdrawal. However, withdrawals of rollovers, conversions, or investment gains are a different story. To avoid Roth IRA early withdrawal penalties when it comes to Roth IRA rollovers or conversions, you need to be age 59 ½ or older and meet the requirements of the 5 year rule. The 5 year rule is applied differently to rollovers and conversions than it is to regular contributions. Each Roth IRA rollover or conversion you perform is independently subject to a 5 year waiting period before you can make tax-free, penalty-free withdrawals. For instance, let's say you're 60 years old. You started funding your Roth IRA ten years ago, and you converted your Traditional IRA to a Roth IRA at age 58. Under IRS rules, even though you're older than age 59 ½, if you withdraw any of those converted funds, they'll be designated as an early withdrawal. Because your Roth IRA conversion from two years ago hasn't yet met the requirements of the 5 year rule. Once five tax years have passed, then and only then can you withdraw those funds tax-free and penalty-free. To avoid Roth IRA early withdrawal penalties when it comes to Roth IRA investment gains (such as interest, dividends, and capital gains), you need to be age 59 ½ or older and meet the requirements of the 5 year rule. But unlike Roth IRA rollovers and conversions, you don't have to worry about different starting times for the 5 year waiting period. If your Roth IRA has been open and funded for more than 5 tax years, and you're older than age 59 ½, then you can withdraw investment gains from your Roth IRA without taxes or penalties. For instance, let's say you're age 58. You started funding your Roth IRA at age 47, and now you'd like to start withdrawing on your account. In such a scenario, if you withdraw any investment gains they're subject to both income taxes and a 10% early withdrawal penalty. Because at age 58, you're still a year and a half away from the Roth IRA early withdrawal threshold age of 59 ½. So even though your account meets the requirements of the 5 year rule, you still need to wait until age 59 ½ before you can withdraw investment gains without owing taxes or penalties. As with anything else, when it comes to early Roth IRA withdrawals, there are exceptions. 1) You die and your heir closes the account. 3) You withdraw a series of "substantially equal periodic payments" based on your current life expectancy. 4) Withdrawn funds are used to pay qualified higher education expenses for yourself or eligible family members. 5) Withdrawn funds are used to pay the costs of purchasing a first home ($10,000 limit). 6) Withdrawn funds are used to pay for unreimbursed medical expenses which exceed 7 1/2% of your Adjusted Gross Income (AGI). 7) Withdrawn funds are used to pay for medical insurance premiums after you receive unemployment benefits for more than 12 weeks. 8) Withdrawn funds are used to pay back taxes you owe the IRS. If you think any of the above circumstances describes your situation, make sure you consult a qualified financial professional before attempting to take advantage of one of these Roth IRA early withdrawal exceptions. Meet those requirements, and you won't have to worry about income taxes or the 10% early withdrawal penalty!